In this article, we will discuss about the Procedure for Downloading the IBPS RRB Admit cards.If you have appeared for IBPS Exam in the past, then you must be aware of the procedure for Obtaining the Call letter. This article is aimed at helping those, who are freshers in the Banking arena and didnot frequently apply for IBPS Exams. 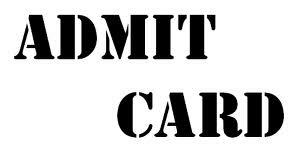 How to Download the IBPS RRB Call letter 2012 ? These are simple steps and a matter of few clicks. You need not be a computer expert to Download the Call letters for IBPS RRB Exam 2012.Follow the steps below and download the IBPS Admit Card. Call Letters can be downloaded only from the Official Website of IBPS ie, www.ibps.in. So open www.ibps.in your Browser. After opening it, now you have to click on the link marked as CWE-RRBs on the left side of the page. Again, on this page, you have to click on the appropriate link, that points for Downloading the Call letter. After entering the Details, you have to click on the "SUBMIT" button.After that, your Call letter will appear on the Screen. Now there are two options either You can save the Call Letter in PDF Format or you can take the Print Out of the Call letter. Students are also advised to Check their In Box regularly, as there is every Likelihood that IBPS may also send the Call Letters by Email. The Call letter is the Mandatory Document for appearing in the IBPS RRB Exam and the same must be produced at the time of Written Examination.Along with Call letter, you will also have to produce your Identity Proof in Original as well as Photocopy. Students are also advised in their own interest to reach the Examination Hall well before the Time Printed in the Call letter, in order to avoid the last minute trouble.